Son of James Cunliffe, a retired police constable turned grocer. Came to Farnworth when aged 8 when his father was appointed as a police sergeant in the town. When he left school he became an assistant to William Sumner, grocer and provision merchant. In about 1887 he started on his own as a baker and confectioner at 73 Market Street, Farnworth. 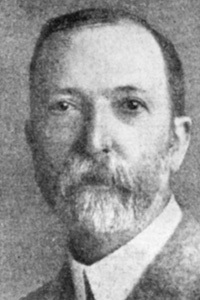 He was a member of the Board of Guardians from 1894 to 1911 and was Chairman from 1905 to 1907. Represented South-east Ward from 1909 and served continuously for 27 years until his death. He was due to retire in April 1938 and was the oldest member both in years and service. In 1915 he was made a Magistrate. He was Chairman of the Finance and Housing Committees but his particular interest was education, having joined the Education Committee firstly as representative of the Wesleyan Body. He was still Chairman of the Committee at his death. Governor of Farnworth Grammar School. He represented Farnworth on the governing body of Bolton School, the Bolton and District Town Planning Committee, the Public Assistance Committee and the Administrative and Clerical Services of the Lancashire and Cheshire Whitley Council. He was also a former Chairman of the Farnworth, Little Hulton and Little Lever Joint Infectious Hospital, Vice-Chairman of the Manchester and District Smoke Abatement Committee and was a member of the Bolton Commission for Income Tax. In 1922 he was elected to Lancashire County Council, serving for 3 years. In 1924 he was appointed a Trustee of the Rishton and Seddon's Charities and was a former Chairman of the Old Aged Pensions Committee. Treasurer of the Farnworth Divisional Liberal Association and took a prominent part in many parliamentary elections. He was a member of Farnworth Cricket Club and enjoyed a game of bridge. He was an official at Holland's School for 40 years and was superintendent, as well as teacher of the first class of young women. Wesleyan Methodist - he was connected with the Wesley Chapel and Holland's Sunday School for 70 years and at the former occupied every office open to a layman. These included, Poor Steward, Society Steward and Circuit Steward as well as Secretary to the Trustees. He was also Trustee of several Farnworth Wesleyan churches and was a lay member of the Bolton District Synod and a member of the Bolton Mission Committee. One of his sons was Deputy Clerk to Farnworth Council and his three daughters worked in his business. He carried out his public duties to the last, attending, with other members of the Council, the Farnworth Amateurs production of Rose Marie and in early December a Whitley Council meeting in Manchester. His last public act was to write a letter from his bed to the December Council meeting expressing his support for a Charter of Incorporation, a subject in which he was greatly interested. When he died The Farnworth Journal wrote "It can be truthfully said that he served his day and generation to the fullest limit of his ability. He never spared himself in the service of his fellows and his life and work will leave their mark on the future history of Farnworth."